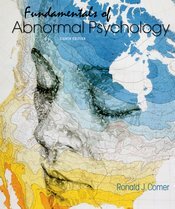 The #1 bestselling author of introductory textbooks in abnormal psychology, Ron Comer is remarkably skillful at communicating the scientific foundations, the clinical realities, and the human cost of psychological dysfunction. In this new edition of his brief text, Comer again draws on his experience as an educator, researcher, and practicing therapist to cover the basic concepts of psychopathology in a way that is scientifically sound, widely accessible, and extraordinarily empathetic. The new edition features Comer’s signature integration of theory, diagnosis, and treatment, as well as his broadly inclusive cross-cultural perspective. In addition to updated coverage throughout, it offers a number of features created under Comer’s supervision that bring fresh, effective new teaching approaches to the text and accompanying media, including infographics (large-scale step by step illustrations of complex concepts), video case studies and activities, and the new online feature, Clinical Choices, which puts students in the role of clinical psychologist.